Every spring I help my daughter Jamie plant a small garden. This year Jamie planted about a dozen tomato and pepper plants, some onions, and fresh basil. This gave us plenty of fresh tomatoes and peppers into the late summer months. 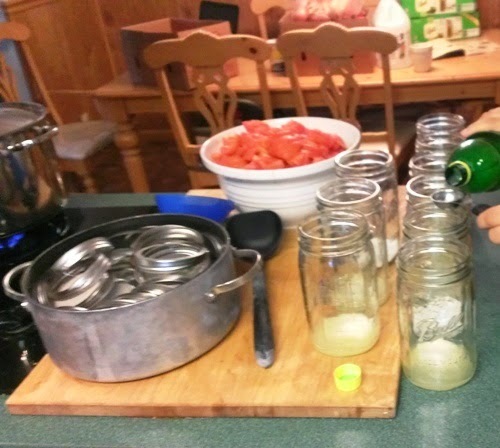 Last season Jamie decided that she wanted to do some canning. I was so excited and offered my help right away, as I hadn’t canned anything in years. Although we had some tomatoes and hot peppers left from her garden, we wanted more, so we proceeded to go out and buy more. 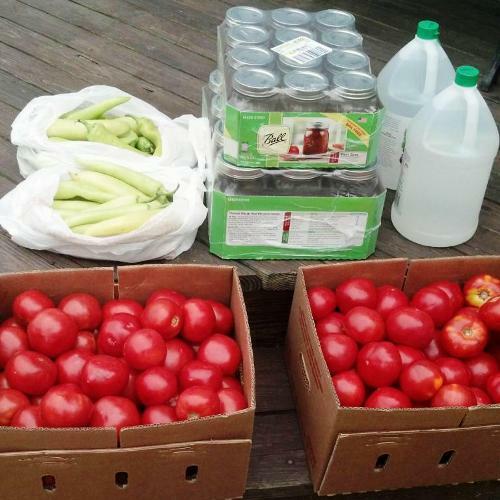 We decided that two more boxes of tomatoes would do the trick, and the following is how we did it. With the tomatoes from her garden and the two boxes we purchased we figured that we had a bushel or more. We didn't have our old family recipe, so we used the Ball Blue Book Guide to Preserving as a reference. This book was a great help. We didn’t have a pressure cooker and this book walked us through the process. 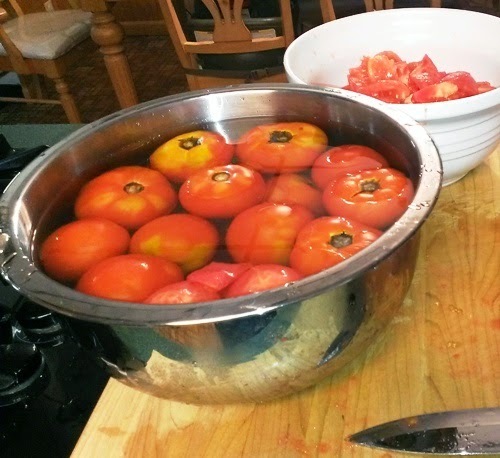 We put the tomatoes in boiling water for 60 seconds, and then put them in ice water; this process makes it easy to remove the skin and the core of the tomato. Then we cut the tomatoes into quarters and put them in bowls. We did this all by hand. After washing the jars in soapy water and thoroughly rinsing them we added: 2-Tablespoons of Lemon Juice and 1-Teaspoon of pickling salt to each jar. 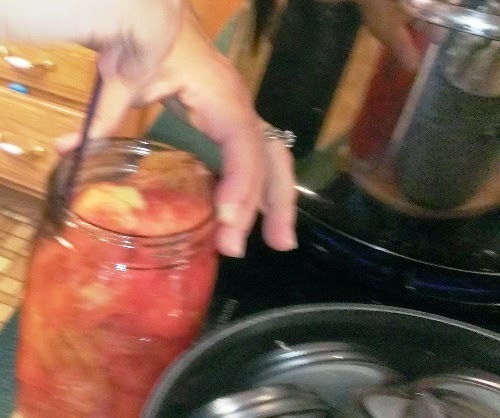 Then we filled the jars with the cut tomatoes and packed them down tightly. After the tomatoes were packed in the jars we ladled in boiling water until it was just over the top of the tomatoes. We then put the jars in boiling water making sure there are at least two inches of water over the tops of the jars, cover the pot with a lid and boil for 55 minutes. Lift the jars out of the pot using a jar lifter, let them sit for 48 hours, look at the center lid of the jar, it should be concave after this process. We yielded 26 quarts of tomatoes for the day. 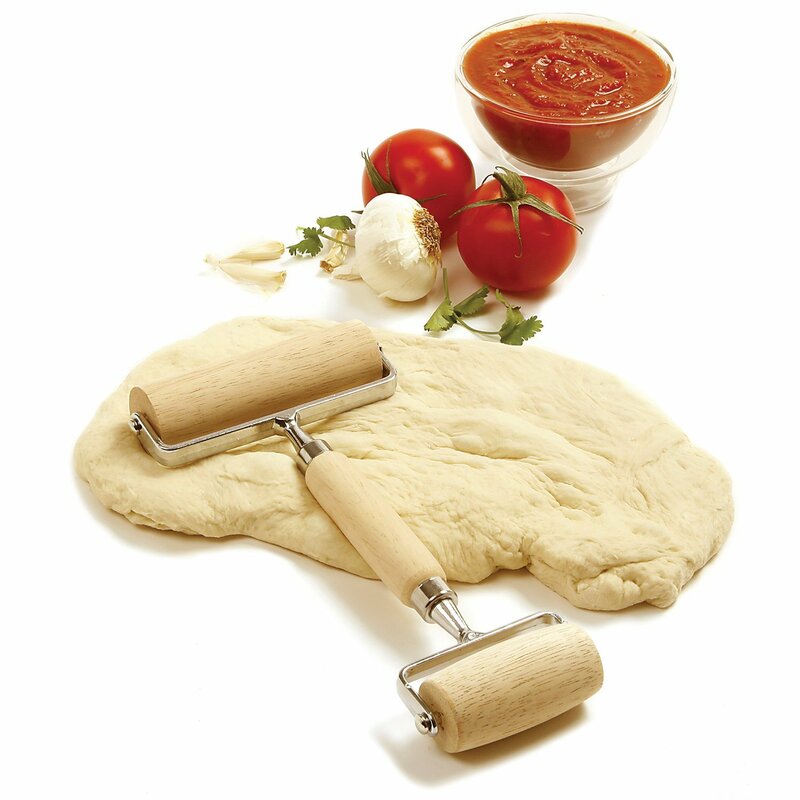 Now we'll have fresh tomatoes for pasta, salsa, and chili. 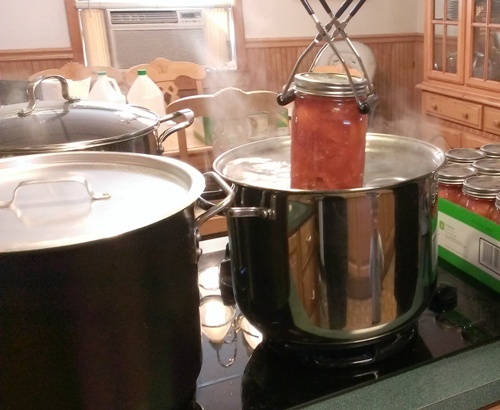 This was our big weekend of canning, we had so much fun. 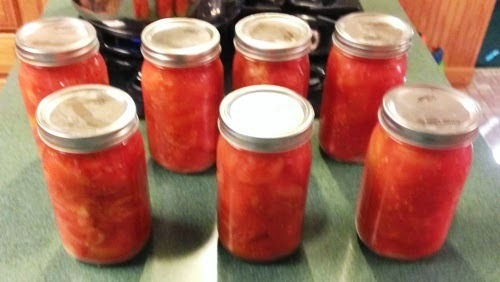 I hope you enjoyed our method of canning tomatoes. 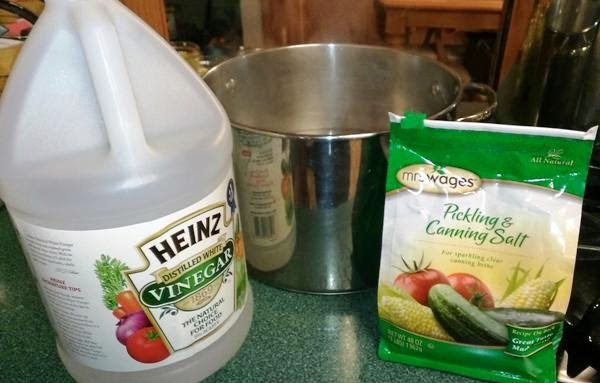 Please feel free to leave any of your tips for canning in the comments. We live in Western New York where the grilling season can be short. Outdoor cooking has always been a passion of mine. I have cooked on gas grills, but I really prefer charcoal. I like the ease and connivance of cooking on a gas grill, bur love the flavor of cooking with charcoal, so I do both. You may live in a part of the country where you can cook outdoors all year long and that's fantastic. I highly recommend The New Grilling Book from Better Homes and Gardens. Although who said that you can't cook outdoors in the winter, I've done it on several occasions. 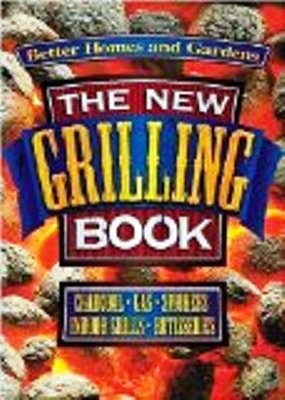 The New Grilling Book offers the best advice for cooking on charcoal and gas grills, smokers, indoor grilling and rotisseries. This book gives you what they call GRILLING BASICS, with some great techniques, and understanding the difference between direct and indirect heat. The book is also packed with page after page of fantastic grilling recipes. There are so many great books out there for grilling, but this happens to be the one I have, and I love to use over and over again. As always Thanks for stopping by, and I hope you enjoy. Have you ever had breakfast for dinner? Oh yes we do this a couple of times a month. Most of the time we have pancakes, eggs, and bacon. This time my daughter decided to make Eggs Benedict, with bacon and sausage on the side, and we also had pancakes. So the next time you have breakfast for dinner or breakfast in the morning you may want to give this one a try. To make this delicious meal even quicker she used McCormick’s Hollandaise sauce in a package. First prepare the hollandaise sauce, bacon, and sausage links. I don’t know about you but I like my bacon crispy. Toast the English muffins, and fry your eggs on your favorite griddle. Now place the Canadian bacon on the muffin halves, add your egg on top, and pour over the hollandaise sauce. Top it all off with a sprinkle of Paprika. Serve with your bacon and sausage links for a great breakfast for dinner. This was enough for 3 adults, the kids had the pancakes. Get your gardens ready and be sure to plant plenty of hot and sweet banana peppers. If you don’t plant a garden you can buy a plentiful supply of peppers at any local farmers market. 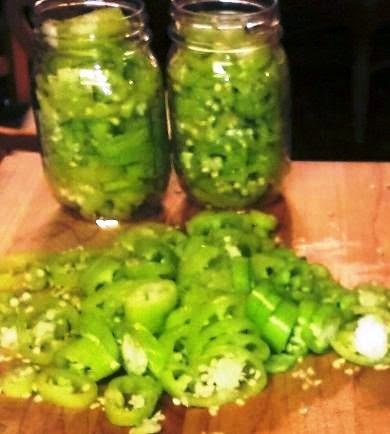 This is an easy wat to preserve hot peppers without canning. I like hot peppers on pizza, sandwiches, and even in salads. This is a simple brine, and it's so easy to make, for preserving hot and sweet peppers so you can enjoy them all year long. We especially enjoy finding the hot banana peppers, and cutting them into rings. I pack the peppers and seeds tightly into every jar. Add you garlic and seasoning, then pour in the brine. Top off with olive oil and close the tightly. In about two weeks you'll be enjoying tasty hot peppers for whatever you choose to put them on, it’s that easy to preserve hot peppers without canning. Pour the cool brine into the jars to cover the peppers. Just enough to cover the tops. Seal the jar and give it a few shakes to mix it up well. 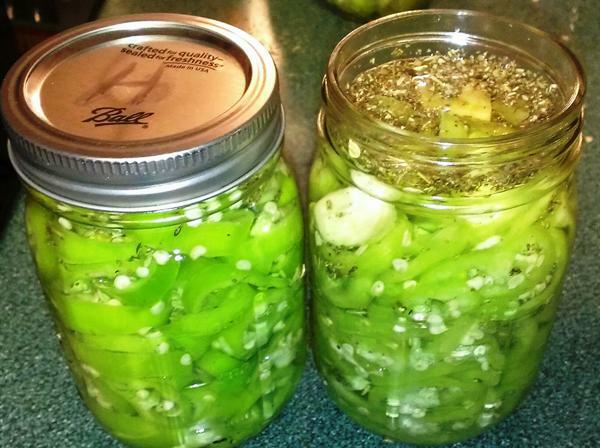 Tip: After you empty your jars of these amazing peppers save the garlic in the jar. Now you can use the garlic for cooking. As always thanks for stopping by and enjoy. This is one of our favorite recipes especially when the growing season is coming to an end; the peppers are so fresh picked right out of the garden. If you don’t have a garden you can buy some really nice peppers at a farmers market, or the grocery stores will usually carry fresh produce locally grown. Stuffed peppers with jasmine rice is a quick and easy meal for your family, or if you’re going to entertain friends for dinner. You can prepare these ahead of time and just pop them in the oven just before your friends arrive. These stuffed peppers served with a salad makes a complete meal for your family or friends. A tip from my daughter, she uses the jasmine rice because it’s sticky and holds the mixture together very well. In a large bowl, combine the ground beef, bread crumbs, eggs, cheese, garlic powder, onion powder, Worcestershire sauce and mix together well, set this aside. Cut the tops off of the peppers and remove all of the seeds, rinse them with cold water. Par boil the peppers, just about 10 minutes, depending on the size. Stuff the peppers with the mixture, place them in a casserole dish standing up, and then pout the tomato sauce over the peppers. Place the lid on your casserole dish, or cover the peppers with tin foil.